ONE of the biggest millers in the country, National Foods Limited (NFL) says it will today switch off its wheat milling machines, citing non-payment of its foreign suppliers, with the country facing possible flour and bread shortages as the foreign currency crunch continues to bite. Zimbabwe has been grappling with shortages of foreign currency since 2016, while the falling value of its surrogate bond note currency on the black market and a new tax on electronic transactions has triggered steep price hikes. “Unfortunately, due to delays in repatriating payments to our foreign wheat suppliers, our wheat suppliers have today (Monday) instructed National Foods to immediately cease drawn downs of wheat stocks. 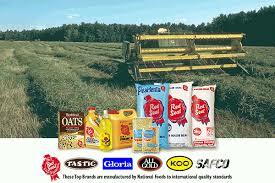 National Foods will not mill out the wheat in the process, and we anticipate both our mills in Harare and Bulawayo to close on Wednesday, 5th December,” chief executive Michael Lashbrook said in a statement. However, Lashbrook said the company had “a full pipeline of both imported and local wheat booked and that once payment is made, we will immediately restart milling operations”. The developments are likely to spark widespread shortages of flour and bread, which comes over two months after millers had previously suspended operations owing to wheat shortages. Zimbabwe requires about 460 000 tonnes of wheat annually, but local wheat farmers on average produce 180 000 tonnes, with the balance imported at a cost of $20 million. In September, Zimbabwe was left with less than a month’s supply of wheat after a United Kingdom-based supplier held back a 30 000-tonne consignment at Mozambique’s port of Beira over payment delays. RBZ was later forced to intervene and availed 80% of the foreign currency demand for the consignment. Wheat shortages are blamed on foreign currency challenges despite Treasury saying it is prioritising wheat imports. Grain Millers Association of Zimbabwe chairperson Tafadzwa Musarara, who organised an urgent meeting for millers yesterday, said other millers had committed to remaining open. “We have been advocating for more foreign currency allocation . . . but the issue of closing down is not a GMAZ issue, it is an individual (company) issue and we cannot stop someone from closing down,” Musarara said.